J. N. Roberts, of Iron Hill and Clark Mitchell, of Eddyville, were before the board of pension examiners at this place Wednesday. E. H. Porter to J. N. Roberts 50 acres for $600. Died on the morning of the thirteenth of December 1892, little Hugh infant son of J. N. and Ida. M. Roberts, aged four months and six days. We administered many remedies, we mingled our prayers and tears together as we watched by his little cradle bed, but in vain, he faded like a gentle flower before our weeping eyes. His little body gave a way beneath the mortal stroke of disease and his spirit returned to God who gave it. And we are left here to wade through the trials and bereavements of earth, looking forward to the time when we will go home to that sweet babe. But we are not left to ourselves, this is our faith, that the same loving hand that took our darling from our embrace is still leading and guiding us, bringing us each day nearer home and everlasting happiness. Where pain and parting comes no more. Source: Crittenden Press. (Marion, Ky.) 1879-1907, June 15, 1893, Image 4 - Chronicling America - The Library of Congress. Nelse Roberts lived on the headwaters of Piney and when he woke up, the water was over the floor of his house. He raised a loud and long cry, and neighbors ferried him out. Source: Crittenden Press. (Marion, Ky.) 1879-1907, June 28, 1900, Image 1 - Chronicling America - The Library of Congress. Mr. Nelse Roberts was in town Tuesday. He says that it was a mistake about the water getting into his house; it got high enough to get his crop and chickens, but did not get into the building. Source: Crittenden Press. (Marion, Ky.) 1879-1907, July 7, 1900, Image 5 - Chronicling America - The Library of Congress. Mr. W. F. Lamb paid a visit to J. N. Roberts Saturday evening. Source: Crittenden Press. (Marion, Ky.) 1879-1907, September 13, 1900, Image 8 - Chronicling America - The Library of Congress. J. N. Roberts attended Sabbath school and prayer meeting at White Union last Sunday. Source: Crittenden Press. (Marion, Ky.) 1879-1907, September 20, 1900, Image 8 - Chronicling America - The Library of Congress. Frank Roberts was released from road work, but his motion to be released from poll-tax was rejected. Source: Crittenden Press. (Marion, Ky.) 1879-1907, October 4, 1900, Image 4 - Chronicling America - The Library of Congress. Mr. John N. Roberts has sold his interest in the sorghum mill to G. F. Roberts. Miss Vida Travis was the guest ot Vienna and Elma [Elva] Roberts Saturday night. J. N. Roberts and son spent Monday and part of Tuesday in Providence on business. J. N. Roberts is on the sick list this week. Source: Crittenden Press. (Marion, Ky.) 1879-1907, October 25, 1900, Image 8 - Chronicling America - The Library of Congress. G. F. Roberts has finished making molasses for this season. S. N. [J. N.] Roberts is in poor health. Source: Crittenden Press. (Marion, Ky.) 1879-1907, November 1, 1900, Image 8 - Chronicling America - The Library of Congress. Aunt Mary Lamb, Mrs. Mary Murray and Mrs. Ida Roberts were the guests of Aunt Sarah Woodsides Monday. Source: Crittenden Press. (Marion, Ky.) 1879-1907, November 8, 1900, Image 4 - Chronicling America - The Library of Congress. George Travis, of Tribune, spent last Wednesday night with G. F. Roberts. Frank Roberts, Henry Murray and Telker are cutting bolts on J. N. Roberts farm. Source: Crittenden Press. (Marion, Ky.) 1879-1907, November 29, 1900, Image 8 - Chronicling America - The Library of Congress. J. N. Roberts went to town Tuesday. It is the first stirring around he has done for some time. 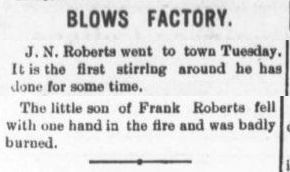 The little son of Frank Roberts fell with one hand in the fire and was badly burned. J. N. Roberts visited his brother George Thursday. Source: Crittenden Press. (Marion, Ky.) 1879-1907, January 31, 1901, Image 4 - Chronicling America - The Library of Congress. George Roberts and wife are suffering with grip. Source: Crittenden Press. (Marion, Ky.) 1879-1907, February 7, 1901, Image 8 - Chronicling America - The Library of Congress. Mr. J. N. Roberts is sick. Uncle Henry Stembridge paid J. N. Roberts a visit Thursday. Source: Crittenden Press. (Marion, Ky.) 1879-1907, February 21, 1901, Image 8 - Chronicling America - The Library of Congress. Frank Roberts has a full set of carpentry tools and has gone to killing rabbits. Source: Crittenden Press. (Marion, Ky.) 1879-1907, February 28, 1901, Image 8 - Chronicling America - The Library of Congress. John N. Roberts visited his son Frank Roberts Sunday. Source: Crittenden Press. (Marion, Ky.) 1879-1907, March 7, 1901, Image 4 - Chronicling America - The Library of Congress. J. N. Roberts visited Rufus Riley Sunday. Mesdames N. J. and Susie Kemp were the guests of Ida M. Roberts Sunday. Source: Crittenden Press. (Marion, Ky.) 1879-1907, March 21, 1901, Image 8 - Chronicling America - The Library of Congress. Mrs. Elrod visited Mrs. Ida Roberts Sunday. Source: Crittenden Press. (Marion, Ky.) 1879-1907, April 4, 1901, Image 8 - Chronicling America - The Library of Congress. Misses Nora Riley and Ivy McDowell were the guests of Vienna and Elva Roberts this week. Source: Crittenden Press. (Marion, Ky.) 1879-1907, April 11, 1901, Image 9 - Chronicling America - The Library of Congress. J. N. Roberts visited Rufus Riley on Wednesday. Source: Crittenden Press. (Marion, Ky.) 1879-1907, April 25, 1901, Image 8 - Chronicling America - The Library of Congress. Mrs. Ida Roberts and Aunt Jane Kemp visited Aunt Dosha McChesney a few days ago. Source: Crittenden Press. (Marion, Ky.) 1879-1907, May 5, 1901, Image 8 - Chronicling America - The Library of Congress. R. M. Riley was the guest of J. N. Roberts Sunday. Dowin Sutton was the guest of John Roberts Sunday. G. F. Roberts and Harvey Vanhooser visited J. N. Roberts Sunday. John E. Roberts was the guest of his brother near Blows Factory last Saturday. Mrs. J. C. Brown and family visited Mrs. Ida Roberts Wednesday. Mrs. Eliza Elrod visited Mrs. Ida Roberts Sunday. Source: Crittenden Press. (Marion, Ky.) 1879-1907, May 30, 1901, Image 8 - Chronicling America - The Library of Congress. Mrs. Laura Lamb visited Mrs. Lou Roberts Sunday. Mrs. S. J. Travis, of Tribune, visited her brother Geo. Roberts Sunday. Source: Crittenden Press. (Marion, Ky.) 1879-1907, June 6, 1901, Image 16 - Chronicling America - The Library of Congress. Miss Vida Travis of Tribune was the guest of Misses Vienna and Elva Roberts this week. Source: Crittenden Press. (Marion, Ky.) 1879-1907, June 13, 1901, Image 8 - Chronicling America - The Library of Congress. John Terry was the guest of George Roberts last Sunday. Source: Crittenden Press. (Marion, Ky.) 1879-1907, June 27, 1901, Image 8 - Chronicling America - The Library of Congress. Miss Edna Roberts closed her school Saturday with good results. Source: Crittenden Press. (Marion, Ky.) 1879-1907, July 4, 1901, Image 8 - Chronicling America - The Library of Congress. Mrs. Louisa Clift and family of Bordley were the guests of her sister, Mrs. Ida Roberts this week. J. N. Roberts is very ill.
J. N. Roberts went to Providence Sunday. Source: Crittenden Press. (Marion, Ky.) 1879-1907, July 18, 1901, Image 8 - Chronicling America - The Library of Congress. J. N. Roberts visited friends near Dalton Tuesday. Mrs. J. N. Roberts has been very ill. Source: Crittenden Press. (Marion, Ky.) 1879-1907, July 25, 1901, Image 8 - Chronicling America - The Library of Congress. 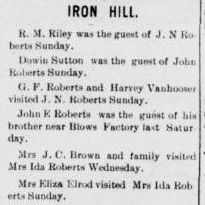 Mrs. J. N. Roberts and sons are visiting relatives in Union county this week. Source: Crittenden Press. (Marion, Ky.) 1879-1907, August 1, 1901, Image 8 - Chronicling America - The Library of Congress. Miss Vida Travis, of Tribune, was the guest of Misses Vienna and Elva Roberts Friday and Saturday. Mrs. Georgeana Felker, of Blackburn neighborhood, was the guest of Mrs. J. N. Roberts Monday. 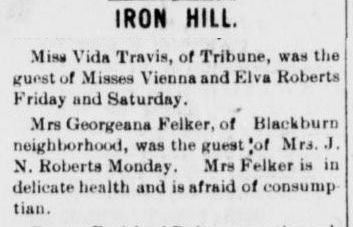 Mrs. Felker is in delicate health and is afraid of consumptian [sic]. Source: Crittenden Press. (Marion, Ky.) 1879-1907, August 29, 1901, Image 16 - Chronicling America - The Library of Congress. J. E. Roberts, who is attending school at Olive Branch, spent Saturday night and Sunday at home. Source: Crittenden Press. (Marion, Ky.) 1879-1907, September 12, 1901, Image 18 - Chronicling America - The Library of Congress. J. N. Roberts returned from Union county Sunday. Source: Crittenden Press. (Marion, Ky.) 1879-1907, October 17, 1901, Image 8 - Chronicling America - The Library of Congress. J. N. Roberts visited his son Harvey, near Mattoon Sunday. Source: Crittenden Press. (Marion, Ky.) 1879-1907, October 24, 1901, Image 9 - Chronicling America - The Library of Congress. J. N. Roberts moved to the Mattoon neighborhood last week. Source: Crittenden Press. (Marion, Ky.) 1879-1907, December 19, 1901, Image 17 - Chronicling America - The Library of Congress.